Neutral Tan Color for Placement in Any Setting. 12 Pockets to Display Many Periodical Options. Steel Manufacturing Makes this Unit Last & Last. 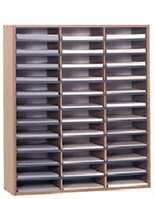 This metal literature holder features a frame that is made of strong steel to be a durable countertop store fixture. 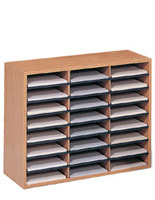 The display has a dozen slots to make it perfect for school use as mailboxes for employees or students. 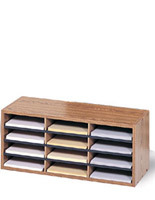 The literature holder for magazines also makes perfect sense as a retail store fixture that will showcase periodicals, forms, or specialty papers all for use or by customers. The tan color of the display provides an inviting look, but with a neutral color so it can fit anywhere. The holder is made to be placed on countertops for easily viewing by clients or customers. 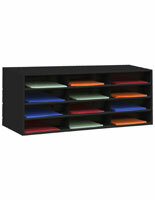 The magazine organizer is a sturdy display because of its steel construction and will last in retail settings.